The Munich Oktoberfest is now only a matter of a fortnight away, and if you’re headed back to the Bavarian capital for the festivities, you’ll no doubt be asking yourselves what everyone will be wearing at the Wiesn 2017. Now, before you laugh and say “Lederhosen and dirndls, silly!”, what we mean are the must-have trend items that, besides the usual clothing, are everywhere. Two years back, it was all about little wrist or ankle bands for the ladies, for instance; last year, all the girls had floral hair decorations. So what are the key pieces for girls (and boys) at the Wiesn 2017? The simple answer is that, this time round, it’s not about little details, but about whole items of clothing coming back into focus. For the girls, that means concentrating more on tops and jackets; as ever, it’s a bit easier for the boys. Read on for our quick summary of must-have trends at the Oktoberfest in 2017. 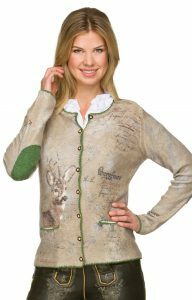 And indeed if you’re the kind of girl that likes to go for a more relaxed or rough-and-ready Oktoberfest outfit, then you’ll find a whole new selection of standard contemporary wardrobe staples with a Bavarian twist. So whether it’s a hoody with floral embroidery and stag-and-antler patches, a classic denim jacket with floral bordering on the waist and sleeves, or a blazer made of soft jersey with Alpine detailing, there’s a suitable jacket for every kind of trouser-based look. Now, the boys are less dependent on fashion trends, sure, but not entirely immune. 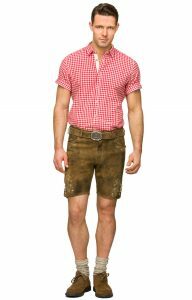 As ever, the staple of men’s Oktoberfest wear are lederhosen, so no worries here. What is notable, however, is that a trend from recent years is set to reach its peak at the Wiesn 2017 – and that it’s actually more about a “must not have” than a must-have. Basically: lose the braces! The only people still wearing lederhosen with the traditional over-shoulder suspenders now are either owners of custom-made leather breeches with a uniquely-stitched panel between the straps or tourists. And you’ve been to Munich so many times that you’re not a tourist any more, are you?